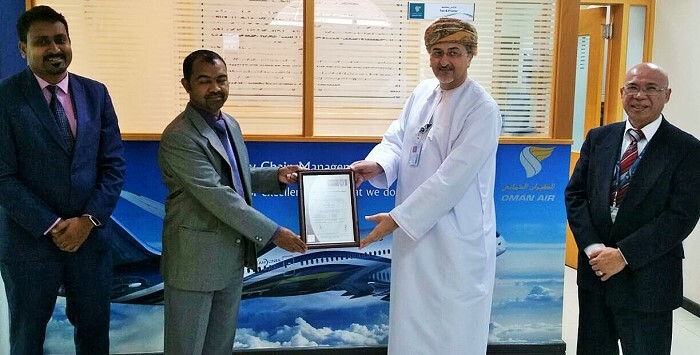 Muscat, Oman, 2017-Oct-06 — /Travel PR News/ — Oman Air’s Supply Chain Management (SCM) has been awarded the ISO 9001:2015 certification by Bureau Veritas under UKAS accreditation, with certificate number IND17.4532 U/Q. ISO 9001:2015 is the latest internationally recognised standard for quality management, ensuring that organisations have proven processes in place to meet customer requirements. The accreditation is granted independently and signifies the high quality of the participating organisation’s work. ISO (International Standards Organisation) certification is aimed to help improve business efficiency and often has positive impact on investment, market share, sales growth, sales margins and competitive advantage, improve employee motivation, awareness and morale and enhance customer satisfaction. ISO 9001:2015 Quality Management System (QMS) is internationally recognised as the world’s leading quality management standard systematic approach to Management, Continual improvement and Factual approach to decision making. This entry was posted in Airlines, Transportation, Travel, Travel Management, Travel Services and tagged Bureau Veritas, Mr Robert Borjal, Mr. Imad Al Lawati, oman air, Supply Chain Management, UKAS accreditation. Bookmark the permalink.